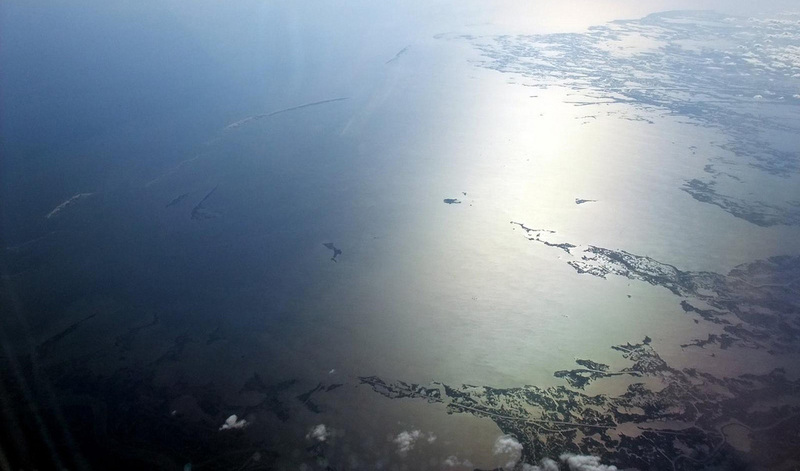 An aerial image of the Gulf Coast above Louisiana. (Inside Science) -- In southern Louisiana, the land is disappearing fast. The region loses 25,000 acres of coastal land every year -- the equivalent of a football field every 15 minutes. The land loss is devastating for the people and economy of the Mississippi River Delta, as the winding bayous that provide a place to fish for shrimp turn into open ocean, and homes are overwhelmed by storms and floods. But the Native American tribes that call the area home are losing not just their land but also pieces of their history and culture. "The loss of land affects where we live, but also our sacred sites, our burial mounds," said Patty Ferguson-Bohnee, a lawyer from the Pointe-au-Chien Indian Tribe in Terrebonne Parish. So the tribe has teamed up with Earl Melancon, who studies coastal restoration at Nicholls State University in Thibodaux, Louisiana, to build up artificial oyster reefs that will help to protect their community and sacred burial mounds from the rising waters. There are a variety of causes of coastal land loss in Louisiana, said Denise Reed, a coastal restoration scientist at the University of New Orleans. Trying to untangle what is happening where is "like doing an autopsy without a body," she explained. Some are natural processes, like wave-driven erosion at the edges, and subsidence, the gradual sinking of coastal land into the ocean. But these pale in comparison to the human-driven causes. Over the past century, New Orleans has been protected from flooding of the Mississippi River by building levees that keep the channel in one place. This mean that the sediments are deposited in a single small area instead of being spread out around the delta, where they help maintain they wetlands. Decades of oil and gas exploration have cut canals, throughout the marshes, that both directly destroy the land and allow salt water to intrude deep into the wetlands, killing the plants whose tangle of roots hold the soil in place. Donald Dardar, the tribe's second chairman, said oil companies have already cut canals through some sacred sites and then failed to maintain them, leaving the banks to erode. And human-caused climate change leads to rising sea levels and more devastating hurricanes that bring massive storm surges to the area. The scale of the problem can seem overwhelming. "People are largely powerless against the forces causing land loss," said Reed. But, she added, there is a lot that can be done, if projects focus on where they can have the biggest impact. Melancon believes his oyster reefs can be one of those projects. The reefs are created using huge, 20-foot-long gabion mats made of UV-resistant plastic mesh filled with limestone. The mats protect the shore from erosion by mitigating wave action and strong currents, and provide a place for oysters to grow. As the oyster reefs form, they provide further protection. Over time the mats will break down, but the reefs stay, providing a natural, living shoreline barrier. Because the reefs continue to grow, they can also keep up with sea level rise on their own, said Melancon. As the water levels rise, the oyster reefs grow upward, because the oysters like to keep the same amount of water above them. People will not be allowed to harvest the oysters, so the reefs should remain intact, but the new oysters will likely provide a source of new larvae that can help repopulate other harvestable sites. Other projects in the area have shown some success using the same technique, said Melancon, and the tribe's burial mounds are a good candidate for protection. "They're on reasonably solid land now, on some of the highest ground around. But they are vulnerable to erosion; it's just a matter of time," he said. "We can't wait until they start eroding; once the land is gone, it can't be replaced." Melancon has done an initial survey to determine that the sediments in the area can support the mats, and he and the tribe are now working with the local government to find funding to get the project off the ground. Dardar hopes that the first reefs can be installed by November, to begin preserving what's left of the sacred sites. "Our ancestors built them for a reason; we don't want to see them go," he said. "As we speak they are washing away, so it's really important that we get this done to protect them for the whole tribe."